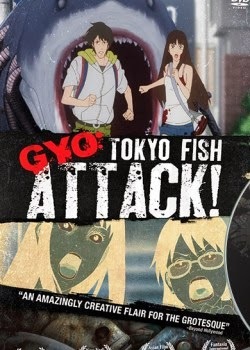 The purveyors of anime at Aniplex have decided to serve up a slice of misanthropic, festering imagery with GYO: TOKYO FISH ATTACK, and gave curious New York Comic Con 2013 attendees an early look at it. The story is based on the work of Manga artist Junji Ito, whose not at all subtle classic horror stories tend toward the classically gruesome and vividly surreal. More well known works, such as Uzumaki and Tomie, have originated from the flow of his inkwell. GYO sets its sights on 3 young women (Kaori, Erika, and Aki) vacationing in tropical Okinawa. Things are fine, save for the heat and a bit of boredom, until a rancid smell permeates the air, perturbing the friends all the way back to their accommodations. Only once there, its presence is even stronger. The source reveals itself to be a grotesque creature with a spindly bug-like torso carrying an aquatic animal’s upper body. No sooner do they destroy and dispose of the disturbing pest than they are roughly greeted by an even larger, shark-like monstrosity. Cut to a vast horde of scaly oceanic monstrosities filling the once quiet streets of Okinawa, and you get a sense of GYO’s briskly paced nightmarish vision. Having wasted little time in setting up the unlikely doomsday premise, the film spends the majority of its time depicting futile attempts to run both to and from the chaos; since Kaori‘s boyfriend Tadashi is in Tokyo she finds herself on the next flight there where she finds an ally in a reporter covering the story. An equally sized portion of the suffering wrought unto those exposed to the epidemic is also doled out. Logic and pacing only rarely make their way into the equation. Despite the achievement of some surreal moments that set this anime apart from many of its peers, GYO still often indulges stereotypes that too often go are a part of the genre. The main characters are familiar archetypes: the traditionally beautiful, successful and selflessly devoted Kaori is the flawless leader. Her first companion is Erika, who is obsessed with her looks and getting laid, the latter being a pursuit she commits herself to with insanely reckless abandon. Then there is Aki, whose lack of concern for maintaining an attractive appearance is accompanied by neurotic insecurity and, as the horror around them increases, a legendary spitefulness. While most characters suffer a cruel fate, Aki seems to bear the worst of it, suggesting a somewhat juvenile contempt for those not yearning to achieve conventional feminine beauty. While Erika and Aki self-destruct under the pressure of a marine marauder onslaught and their stereotyped flaws, Kaori races through an already besieged Tokyo, encountering some coincidences that very handily serve the narrative. For instance, her boyfriend is not only caught in the onslaught of mutated ocean dwellers, but a Frankenstein-like scientist uncle of his appears to play an integral role in the creatures’ presence, and by extension so does he. Twists of convenience such as this don’t do much to increase appreciation of the story. It’s the anime’s eyebrow raising dedication to pushing its grim messages to surreal extremes that does. As Kaori and her reporter ally confront Dr. Koyanagi and uncover very hastily explained theories about the attack, the predatory visitors take on new robotic features and expel flatulent blasts of noxious fumes that themselves appear to be made up of some kind of otherworldly energy. In the midst of the carnage that has befallen the city, Kaori encounters a big tent circus of all things. Right in the middle of the street…Sure. Here, a showy carnival barker incorporates this energy into part of the show. I’ll leave the fate of Tadashi at the hands of his uncle’s unscrupulous tinkering up to your imagination for now, but it is not pretty to say the least. 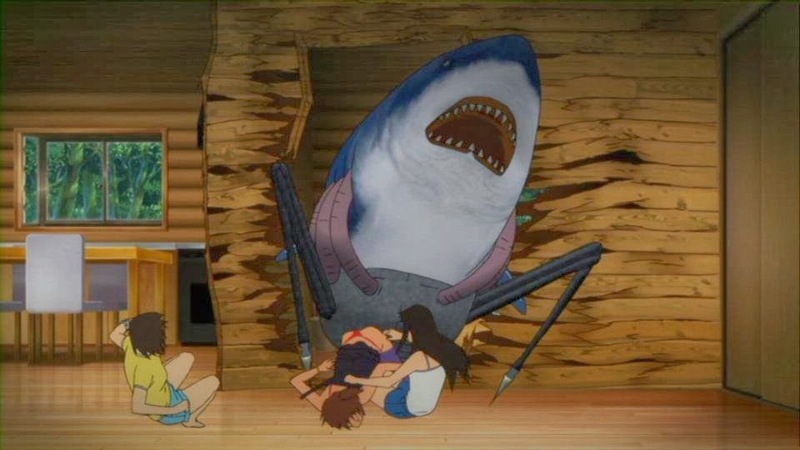 While the anime rests largely on one consistent note of endemic doom, there are a few curious references to some Japanese film favorites that may or may not be intentional. Tadashi’s afflicton as well as the creatures’ own later stage metamorphoses, may remind one of wild physical transformations found in Akira, or even Tetsuo: Iron Man, as pipes and other tangles of metal running rampant. The conclusion, meanwhile, is strangely reminiscent of the melancholic yet hopeful boat seen of Kurosawa Kiyoshi’s Kairo (Pulse). When Kaori finally declares she has begun to get used to the stench of death and decay surrounding her (“もなれていました”), it’s not much of a leap to presume GYO is referring to our own present day invasion-less reality. In this context, the aforementioned disappointing stereotypes may serve a purpose of showing humanity mired in its worst attributes. While not always rising above the tropes of most commercial anime, when it does it achieves levels of derangement that seep down to the bone. GYO: Tokyo Fish Attack is available on DVD from Aniplex. Visit the site for details.